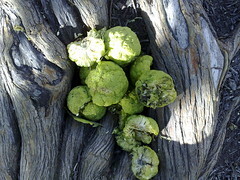 All around Washington, some species of tree drops these huge, bumpy green balls. They'd seriously give you a bump on the head if one hit you. I'm not sure what the tree is that drops these- but the squirrels seem to love them.